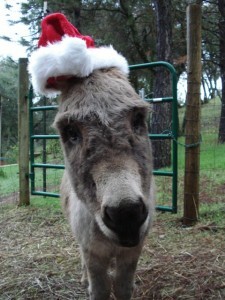 My donkey died last month (no, really). He was nearly thirty, which is about their life span, and he went very quickly. In the morning, Marcus was eating his hay breakfast with this buddy Olivia, and our two goofy goats, then by late afternoon, he was laying down at an odd angle (which isn’t typical) and looked dead. But he was still barely breathing. By the time the vet got to our house, Marcus was staring vacantly, and she realized that he was a goner. She went to her truck to get the medicine to put him to permanent sleep, but in that short time, he had died. He gave one last breath while I sat next him, and was gone. We buried him in the dark. Mercifully, it had stopped raining that day during our very wet winter, but the mud and muck remained and we sloshed through it to his grave site. My family said their last words to our donkey as he lay lifeless in a five-foot hole (tractors are a tool to be grateful for). Both of my kids were upset. 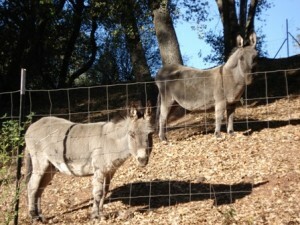 Both of our donkeys have been around since before my kids were born. Marcus was a constant presence, even if it was in a pasture braying for his breakfast. He was always around, following his lady, Olivia, in a humdrum kind of fashion. A.A. Milne wrote Eeyore well because both that donkey and Marcus shared many characteristics. Marcus in the front with his buddy, Olivia, in the back. I was sad about it all, especially the speed at which he went down. Could I have done something more? I wondered. Were there warning signs that I didn’t notice? These were my thoughts that night and the next day. Then, by the third day, I cried. And cried, and cried some more. I questioned why I was getting so upset over a donkey? I mean, I liked this donkey. He was a good donkey, as far as donkeys go, but I didn’t have a special bond with him like people do with their horses. I told my best friend the news who put it all into place. “You’ve had him since you moved there,” she said. “It’s like the end of something.” Aha! She was right. It was the end of the something – the end of the beginning. We moved out to the country almost fourteen years ago. We got Marcus and Olivia soon after that as adoptees. They were there at “the beginning.” It was when we decided to move from Southern California after only living there for a couple years (we didn’t care for it there), when we decided that we wanted “some land” (and five acres was a lot to us, suburbanites), it was the beginning of a new phase of a newly married couple’s life. It’s funny how time can pass so quickly once you live in a place you love, how having children accelerates time, and how you don’t notice that all of us are aging – human, dog, donkey, it’s all going by so fast, you don’t take note. With Marcus suddenly dying, and me realizing that he had reached his actual lifespan, I had to accept that it was officially “the end of the beginning,” and I cracked. Marcus featured on our Christmas card. Like the death of any pet or person, the end of one’s career, the milestone of a graduation, they are all endings to beginnings. “The end of an era,” my dad always says. It certainly was with Marcus. But with the end of things comes the paradox of a new beginning. So, though I do mourn the death of my donkey and the beginning he represented, I know this means the beginning of something new. Possibly a place with only one donkey to bray at us in the morning, or maybe welcoming a new donkey into the family. R.I.P. Marcus – we will miss you. Previous: Why Would You Cleanse – Again?